California DCFS social worker has lied on me saying i abuse my child and i have neglected him/her, and lied on my child's condition while living under state supervision and care. NEW JERSEY-DCP&P, DCF deliberately withheld the truth. The caseworker knowingly lied at each hearing, has harm my child, but then lied and conspired to violate my civil rights,while manufacturing evidence/providing to court repeatedly knowingly et.al., and withheld exculpatory evidence willfully,knowingly. DELAWARE- DFS caseworker lied, and has cause me harm for some time now, without an end in sight. North Carolina- DSS caseworker knew my child was at risk, but yet looked the other way,turned a blind-eye.As a result,my child continued to suffer more. Michigan DHHS withheld exculpatry evidence against me, and i lost my child. Caseworker has lied,falsified,sworn-in false affidavit,to intentionally deprive a parent of such constitutional fundamental right to child." DEADLINES do exist throughout from the inception of the execution of your constitutional/civil rights injury suit pro-se, to the end. When a lawyer, as publicly known shall not represent you, your time is ticking to file suit against Child Protection agency worker's, each passing day. #Accountability is a must when violated. ​#LEARN in a timely fashion,when suing for damages against a CPS employee. Do NOT procrastinate, when you're seeking justice,and accountability when violated by a child protection services employee. Good luck when you are prudently suing, timely executing suit against CPS. 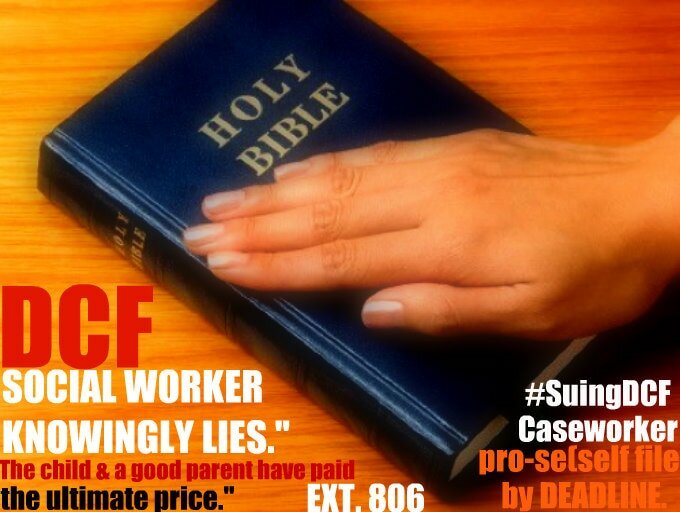 Caseworker lied,falsified,sworn-in false affidavit,to intentionally deprive a parent of such constitutional fundamental right to child." Good luck when you're astutely timely executing suit against CPS. ... Don't wait. Be sure to execute timely your suit for civil right damages,and feel good when you're proceeding to do so,as #OUR RIGHTS DO MATTER. and good luck to all.